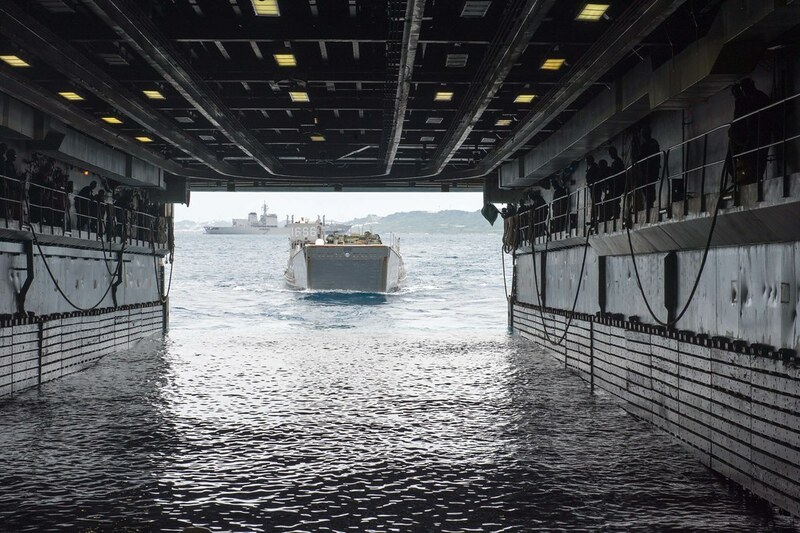 A landing craft utility (LCU) with U.S. Marine Corps equipment aboard enters the well deck of USS Denver (LPD 9), Feb. 5. OKINAWA, Japan - Amphibious transport dock ship USS Denver (LPD 9) completed an onload of Marines and equipment at White Beach Naval Facility Feb. 5. Joining Denver are the 3rd Battalion 1st Marines Kilo Company and Combat Assault Battalion Amphibious Assault Vehicle General Support Platoon. "A lot of Marines don't see a lot of amphibious ship time," said Chief Warrant Officer Dustin Heffel, Denver's combat cargo officer. "So I think its great because the more Marines can come out here the more experience they will gain to make us better." This on-load was conducted to assist Denver with Cobra Gold 2014 exercise. Cobra Gold is an annual exercise conducted jointly between U.S. Navy and Thailand. It focuses on the mutual training interest of the countries and the combined ability to respond to a crisis in a timely manner. The U.S. Navy continually strives to build and strengthen partnerships with its allies. Joint exercises demonstrate enhanced amphibious capability of American and partner nations and promote interoperability through maritime security operations.